In past years, the American Express Shop Small promotion typically offered statement credits when you used your Amex at small businesses on a specified day. This was known as Small Business Saturday, which is set to take place on November 26th of this year. It was actually quite lucrative a couple years ago because they offered three statement credits per Amex card, which translated to maybe 20+ credits per household, depending on how many cards you had. But last year American Express toned things down and only offered a single credit via its Amex Offers to targeted cardmembers. I think I got one $15 credit, which paled in comparison to the prior year. This year they want to drum up excitement again with a 2X rewards offer from now until the end of 2016. 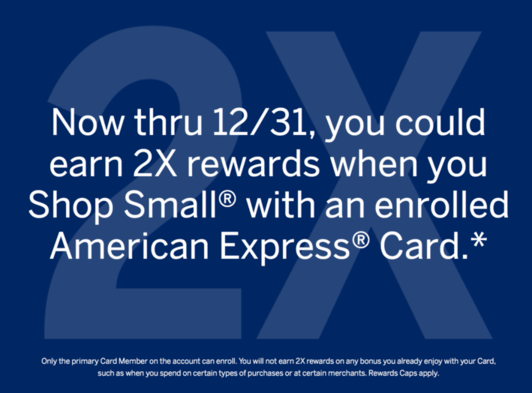 Once you enroll your eligible Amex card(s), you can earn 2X rewards on all purchases at qualifying small businesses through 12/31/16. If it happens to be a card that earns 1% cash back, you’ll earn 2% cash back on those qualifying purchases for the next few months. If it’s a card that earns Membership Rewards points, they’ll be doubled at small businesses through December. Virtually every credit card and charge card is eligible for this promotion aside from a few legacy cards like Old Blue Cash, the Plum Card, Clear, and some others. When you visit their website to enroll, it will let you know if your card is eligible or not. It’s basically a no-brainer to sign up for the promo with all your Amex cards to earn double rewards until the end of the year. How Lucrative Is This Offer? As for it being lucrative, that really depends on what you charge with your Amex cards over the next several months. Remember, it only works at merchants known as small businesses, so you won’t earn the double rewards everywhere. 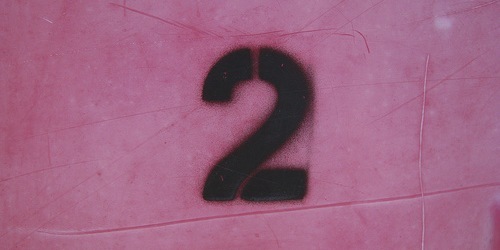 Additionally, it only doubles your 1X category, so earning 2% cash back or 2X rewards isn’t necessarily amazing. I’m sure some folks will figure out how to maximize it, but for many cardholders it likely won’t result in any major rewards boost. For you big spenders, there’s actually a limit to how much you can get doubled. If you somehow manage to spend $100,000 with a personal Amex you’ll be capped out. The same goes for those who muster $250,000 in spending via an Amex business card. After that, you’re back to 1X for each purchase at small businesses. There is at least one company already milking the promotion. Plastiq, which allows you to pay rent or the mortgage with a credit card, is advertising the 2X rewards offer as an eligible merchant. Remember, the small business category is pretty broad, so even seemingly large companies qualify in many cases, not just your neighborhood convenience store. For those who use the company to make large rent/mortgage payments, double rewards is certainly helpful. Still, it won’t offset the full fee 2.5% fee that they charge per transaction. But it will make it a little less painful if you’re trying to meet minimum spend or just increase your MR balance. All in all, I’m not too impressed with this year’s offer. I enrolled my cards, but I don’t know if I’ll actually use them at small businesses. I already have credit cards that earn 2X all year and I’m not a huge fan of MR points anyway. Tip: Only the primary cardholder can enroll in this offer, so authorized users need not apply. Previous Previous post: Are You Better Off Paying Fees to Meet Minimum Credit Card Spend?